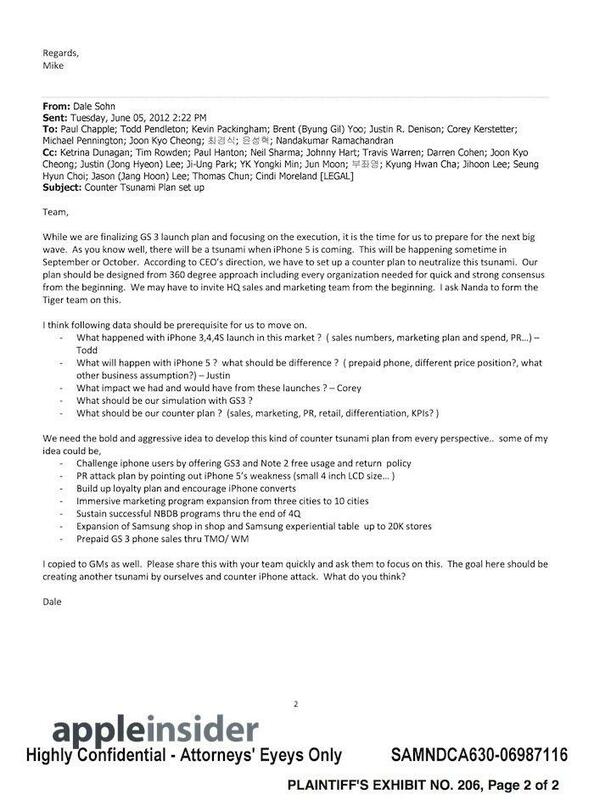 "While we are finalizing [Galaxy S3] launch plan and focus on on the execution, it is the time for us to prepare for the next big wave," wrote Dale Sohn, then president of Samsung Telecommunications America, in an email addressed to 30 other people in June 2012. 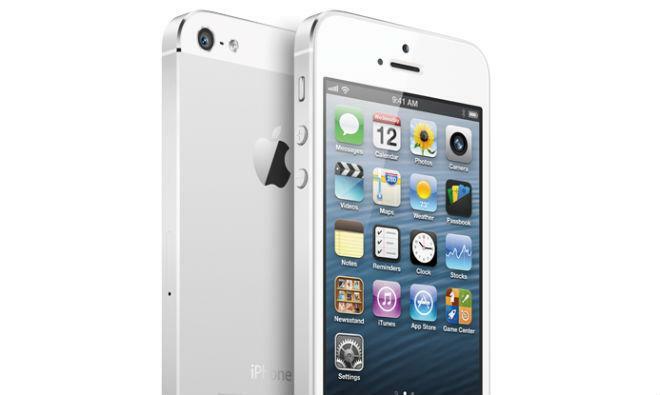 "As you know well, there will be a tsunami when iPhone 5 is coming. It will happen sometime in September or October." "We need the bold and aggressive idea to develop this kind of counter tsunami plan from every perspective," Sohn wrote, suggesting ideas such as a free trial period for iPhone users, intense marketing targeting 3-10 strategic cities and expansion of Samsung's 'store within a store' retail presence "up to 20k stores." He noted, "we need to quickly understand the exact reasons why we win customers away from iPhone," and "we should also quickly understand where we failed to win customers away from iPhone in our initial GS3 launch." The memo added, "as we continue to attack their product, we must also sustain the attack on their customer base. [...] We are working to improve our customer loyalty but our loyal customer must become vocal advocates. "At the same [time] we are attacking Apple, we must thoroughly recognize where we are vulnerable. This will come in many forms. "3. Carrier influence due to contractual commitments." 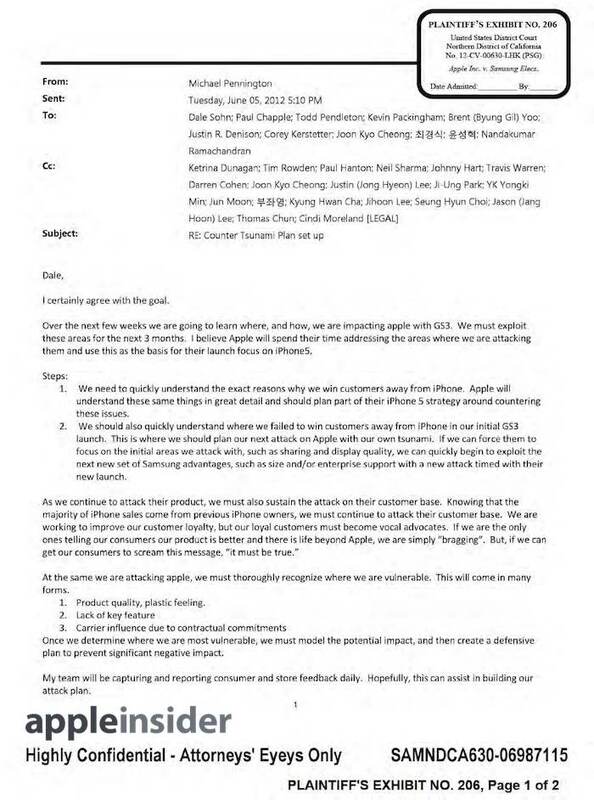 "Where we failed to win customers away from iPhone in our initial GS3 launch"
About eight months prior to the "iPhone 5 Tsunami" memo, Pennington had outlined in October 2011 that "looking deeper into iPhone 4S, it is clear Apple is not worried about us as a hardware competitor, which is where we are focusing." "it is clear Apple is not worried about us as a hardware competitor"
Instead, Pennington wrote that Apple was "continuing to focus on the USER EXPERIENCE, which ultimately puts Google in the center of the target." As an example of this, Pennington wrote "Google's core strength, Search Engine, can be radically minimized by Apple's new iPhone 4S implementation of Siri. [...] My point is, Google must be as motivated as we should be at this point." "Use Google to Attack Apple?" 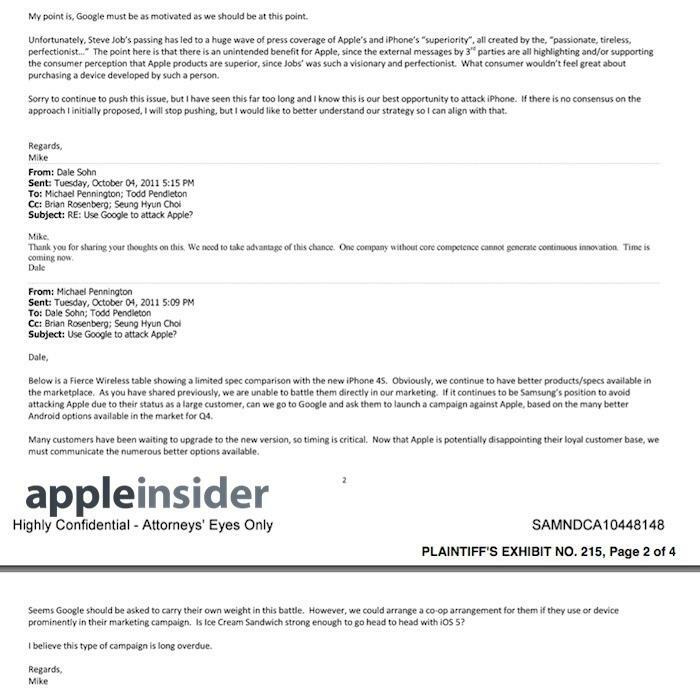 Pennington was arguing for an idea he had brought up earlier in the same email thread titled "Use Google to attack Apple?" In the initial message from four days earlier, Pennington alluded to a previous conversation with Sohn, writing, "as you have shared previously, we are unable to battle them directly in our marketing. If it continues to be Samsung's position to avoid attacking Apple due to their status as a large customer, we can go to Google and ask them to launch a campaign against Apple, based on the many better Android options available in the market for Q4." "To avoid attacking Apple due to their status as a large customer, we can go to Google and ask them to launch a campaign against Apple"
"Many customers have been waiting to upgrade to the new version, so timing is critical," Pennington continued. "Now that Apple is potentially disappointing their loyal customer base, we must communicate the numerous better options available. "Seems Google should be asked to carry their own weight in this battle. However, we could arrange a co-op arrangement for them if they use or [sic] device prominently in their marketing campaign." Pennington then asked, "Is [Android 4.0] Ice Cream Sandwich strong enough to go head to head with iOS 5?" Over the holiday 2011 season, Samsung's stepped up advertising failed to win away iPhone users to its own higher end Galaxy S II flagship. Instead, Apple's existing customers flocked to the latest iPhone 4S, which accounted for 90% of U.S. iPhone sales and caused 42% of customers break their contracts to buy it, as detailed by Consumer Intelligence Research Partners. Samsung, meanwhile, spent 2012 and 2013 spending billions of dollars on even more targeted attack ads. The company's documents indicate it was motivated to continue high spending for its "Beat Apple" ads after seeing immediate results in the "buzz score," "voice" and consumer "brand perception" figures reported by companies that measure the effectiveness of advertising. 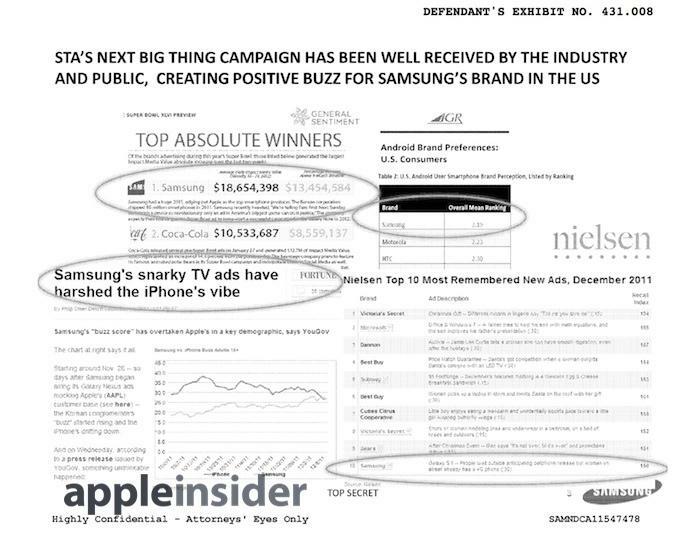 Samsung presented some initial results of its "Next Big Thing" campaign in a "highly confidential" marketing document from February 2012 (below). 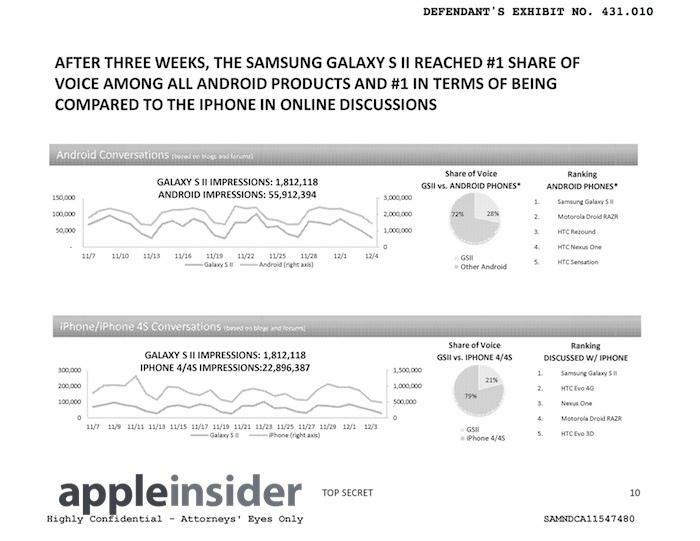 Samsung also highlighted its findings that the GSII had taken a 21 percent "share of voice" in blogs and forums for being discussed in iPhone conversations, and had grabbed a 72 percent majority "share of voice" among all Android conversations. 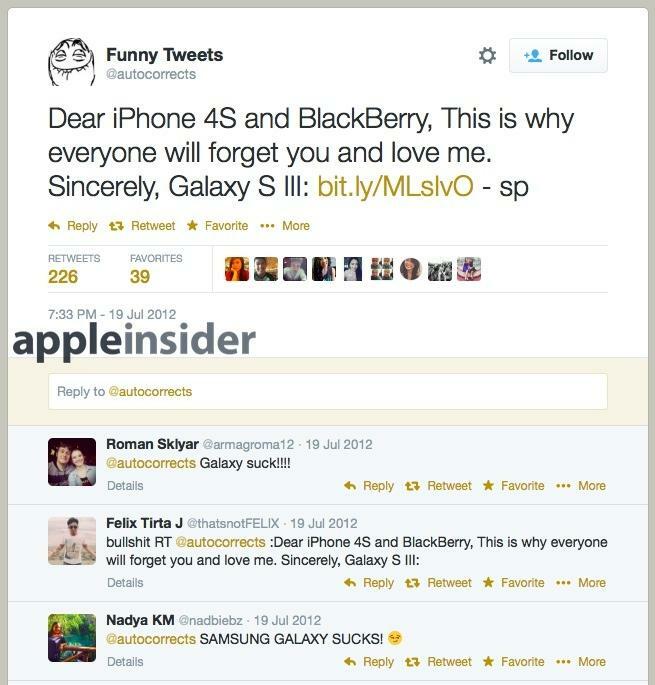 One of the key metrics Samsung had been tracking were Facebook "likes," and one of the primary drivers of those likes, as noted in Samsung's documents, relates to a posting, "Dear iPhone 4S and Blackberry, This is why everyone will forget you and love me. Sincerely, Galaxy S III," with a link to Samsung's Facebook page. The company noted that the message was posted to various social media sites (like Twitter, below) using accounts normally associated with sharing funny memes. 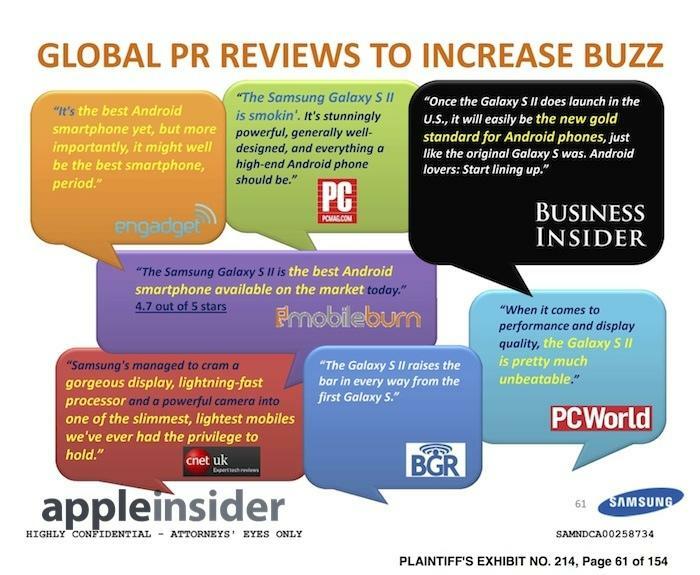 Another avenue for increasing buzz related to "Global PR Reviews," where influential blogs were given special attention to facilitate reviews that might get users talking. Samsung's expensive marketing campaigns and indirect efforts to gain a grassroots buzz and "voice share" radically changed the media's perception of Apple and Samsung, inventing a "lack innovation" problem for Apple while creating the impression that Android, and particularly Samsung, had taken over in the smartphone and perhaps even tablet markets. However, by the end of 2013 enough inside information had leaked about Samsung's actual sales to clarify that Samsung was still only managing to sell a minority portion of the world's premium smartphones compared to Apple, and that it was achieving its overall "market share" through the sale of low end phones it referred to internally as "carrier friendly good enough." Samsung did, however, successfully trample the sales of other Android licensees, including HTC, LG and Google's own aspirations with Motorola, setting itself up in the position to transition its market power away from Google's Android to its own platform. The company still faces concerns from its own investors about how it will accomplish this. For 2014, Samsung has maintained a flagship offering that retains the vulnerability issues of 'product quality, plastic feeling; lack of key feature and carrier influence due to contractual commitments' that Pennington discussed back in 2012. Pennington is among the "at least five" high ranking Samsung executives that have left the company over the past two months, according to a recent report by CNET. Sohn was replaced as STA president by Samsung's Global Marketing Operations chief Gregory Lee last summer. Sohn is now an advisor to Samsung Mobile chief executive JK Shin.